Marcella Duncan, 92, of Bowling Green, Ohio passed away Tuesday October 16, 2018 surrounded by her family. She was born December 18, 1925 in Bowling Green to Aimel and Pearl (Rees) Dahms. She married Clark Duncan on May 12, 1946 and he preceded her in death on February 28, 2014. Marcella worked for many years as a teller at the Bank of Wood County. She served as the Center Township Clerk and spent over 25 years on the Center Township Election Board. She was a devoted member of Cloverdale United Methodist Church where she took on a variety of roles including starting Jr. Sunday School, Sunday school teacher, Sunday school chorister, director of vacation bible school, church treasurer and youth fellowship leader. Marcella was a life member of the Wood County Historical Society, the Pinochle Club and was inducted into the Bowlers Hall of Fame in 2004. In 2006 Marcella received the Outstanding Community Service Award from Gleanor’s and in 2007 she received the Lyle R. Fletcher Good Citizenship Spirit of Wood County Award for outstanding public service. Along with her husband of 67 years, Clark, Marcella was preceded in death by her sister Nedra Soule. Visitation will be held on Thursday October 18, 2018 from 4:00 to 7:00 p.m. at Dunn Funeral Home, located in the Historical District of Bowling Green at 408 West Wooster St. Her funeral service will be held on Friday October 19, 2018 at 1:30 p.m. at Cloverdale United Methodist Church, 8984 Kramer Rd. Bowling Green, Ohio 43402. Pastor Rosanne Kalinowski will officiate. Interment will follow at Portage Cemetery. 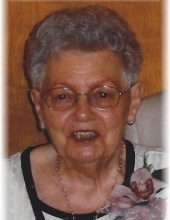 Memorial contributions may be given in her memory to Cloverdale United Methodist Church. To send flowers or a remembrance gift to the family of Marcella Duncan, please visit our Tribute Store. "Email Address" would like to share the life celebration of Marcella Duncan. Click on the "link" to go to share a favorite memory or leave a condolence message for the family.